On Sat. May 1, International Workers Day, hundreds of thousands of people marched in the United States for immigrant rights. Many hundreds of thousands demonstrated across the world for workers’ rights. The struggle of immigrants’ rights is part and parcel of the larger struggle for workers rights. The U.S. protests were the largest immigrant rights demonstrations since the 2006 May Day political strike that revived international workers day in the United States and spelled the death of the fascist Sensenbrenner bill. 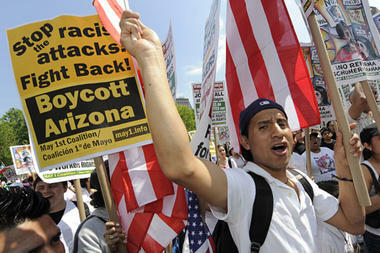 The 2010 demonstrations, planned for months now, took on heightened importance after Arizona Governor Janice Brewer signed SB 1070 into law. The racist law criminalizes undocumented immigrants and institutionalizes racial profiling. The demonstrations that took place in cities across the United States proved, yet again, the power of immigrant workers in the face of such attack. The rally began with a traditional Aztec dance and drum circle that inspired the crowd to clap in unison. At the same time, about twenty racist counter-protestors made every effort to be as visible as possible with their white flags and signs supporting SB 1070. In response, and as long as the racists were there, dozens of demonstrators spontaneously moved in to cover up the racist signs. After nearly an hour of competing with the demonstrators for visibility, the racists packed up and left. In Baltimore, the international workers day demonstration was organized by United Workers, which has been fighting for fair wages. Members of the Party for Socialism and Liberation joined hundreds of workers and allies to participate in a day of action around United Workers’ latest struggle to get the city of Baltimore’s Inner Harbor to put into place a “Fair Development Agreement” which would require all vendors, such as national chains Cheesecake Factory and ESPN Zone and locally owned Phillip’s Seafood, to pay workers a living wage. The workers are also demanding funding for education and health care. “Earth, Education, and Work” were the themes of three street plays also taking place simultaneously in separate locations throughout the city. These themes were chosen because these are the themes that affect the community the most. When each of the acts ended, that group marched to City Hall. The final gathering issued a call to action for the community to work with United Workers. A diverse crowd of over 500 rallied in the Boston Commons for an energetic May Day celebration. The action was organized by the Boston May Day Committee, of which the PSL is a member, and endorsed by nearly two dozen organizations. In addition to drawing hundreds from the Boston area, three buses from Fitchburg and Worcester drove in for the action. Speakers at the opening rally included Roxbury City Councilor Chuck Turner; journalist John Ross; Mike Upton, strike captain and member of UFCW Local 791; Elizabeth Ponce of the Student Immigrant Movement; and Jennifer Zaldana of the PSL. Ponce opened her talk saying, “I’m undocumented but not illegal! And I’m not scared to say it!” She described being denied access to costly higher education because of her citizenship status. She spoke of her realization that the 9 digit Social Security number she lacked was more important than her high SAT scores. The march following the rally stopped at the Hyatt Hotel, honoring the “Hyatt 100” housekeepers who have been fighting to reclaim their jobs after being outsourced in August of 2009. It ended at a military recruitment office, drawing the important connection between U.S. wars abroad and those being waged against poor and working people here. Speaking during the rally, ANSWER organizer and PSL member, Jennifer Zaldana strongly remarked, “Just as the U.S. is occupying the streets of Afghanistan—our streets are being occupied in our neighborhoods by the police, by the landlords, by the banks and corporations that own more today than all of us combined will ever see in a lifetime”. In addition to the Boston march and rally, an estimated 2,000 people marched and rallied in Everett, Chelsea and East Boston. Centro Presente, Chelsea Collaborative, Jobs with Justice and many others organized the event. The action, endorsed by SEIU, explicitly called for the passage of the “Gutierrez bill” HR 4321. The bill, while providing a path to citizenship, accepts the skewed logic of “securing our borders”. The only true solution is full, unconditional legalization and equity between all workers. ANSWER organizers and members of the PSL in Boston participated, bringing placards and literature with important slogans such “Amnistia Ahora! Full Rights for All Immigrants!” and “The Workers Struggle Has No Border”. Twenty thousand protesters came out in Chicago on May 1 to demand an end to racist immigrant profiling and immediate immigration reform. The crowd gathered in Union Park for a lively rally, at which many of the speakers attacked the racist SB1070 recently signed into law in Arizona. “Our struggle will not end until we win full legalization,” said Juan Jose Gutierrez, leader of the Full Rights for Immigrants Coalition at a massive and historic march of over 250,000 people on May Day in Los Angeles. Hundreds of thousands of people gathered and marched to demand immigrant rights and legalization on the biggest march in Los Angeles since the mass pro-immigrant marches in spring 2006. The march stretched over 12 huge city blocks and was stationary for hours due to the throngs of people in downtown LA. Along with the main route on Olympic and Broadway, marchers packed the major parallel streets. The march was organized by all the major immigrant rights groups and coalitions, and the main logistics provided by the Full Rights for Immigrants Coalition, of which the ANSWER Coalition, Vamos Unidos USA, Hermandad Mexicana Nacional, and the Laborers International Union of North America, among others are member groups. ANSWER also was on the Steering Committee of the May Day march in LA. ANSWER leaders and PSL members Carlos Alvarez and Ian Thompson spoke at the main rally, along with Gutierrez, LA County Federation of Labor Executive Director, Maria Elena Durazo, and other labor and immigrant rights leaders. Other speakers included LA Mayor Antonio Villariagosa, Cardinal Roger Mahoney, Angelina Corona of Hermandad, and Julio Marroquin of LIUNA. LIUNA coordinated the march’s security with special assistance from ANSWER. The PSL also led a spirited contingent of hundreds, along with allies from the Alliance-Philippines, KmB Pro-People Youth, the FMLN and GABNet/Af3irm. May Day in LA was a truly electric march that showed a new willingness to fight for just immigration reform, no criminalization and full equality for all. In New Haven, 1,000 people took to the streets for the annual May Day march. The march went down a main avenue in Fair Haven, a predominantly Latino section of the city. Marchers were loud, spirited and energetic, chanting “¡Obama, escucha, estamos en la lucha!” and “Full rights now!” as people from the neighborhood joined the demonstration. The Party for Socialism’s Connecticut branch mobilized heavily for the event. As the march ended, it fed into the Federal Plaza downtown for a rally. Speakers denounced the lack of progress on real and meaningful immigration reform in Congress, Arizona’s racist SB 1070 and the terror of ICE across the country. Speakers also condemned racist police tactics in New Haven and neighboring East Haven, where recent community action and an investigation into racial profiling caused the Chief of Police to be put on leave last week. Around 15,000 workers and immigrants gathered in Foley Square for a May Day march around City Hall. Organized chiefly by the city’s labor unions, the main demands were “Labor and Immigrant Rights! Jobs for All!” In addition to organizing a vibrant and youthful contingent, PSL members distributed flyers calling for full rights for all immigrants. The statement explained why the Democrats’ “reform” bill, sponsored by New York Sen. Chuck Schumer is a big business scam that all workers should oppose. A separate march and rally was organized at Union Square by the May 1 Coalition, which drew thousands more. PSL members participated in both events. International Worker’s Day was celebrated in the San Francisco Bay Area with mass rallies and marches in support of immigrant rights and denouncing the racist illegal Arizona immigrations law SB 1070. There were May Day demonstrations in at least 10 northern California towns, with the numbers ranging from hundreds to thousands. Actions took place in Santa Cruz and Watsonville, Sacramento, San Jose, Santa Rosa, Fremont, Oakland and Berkeley, San Francisco, as well as in Fresno and Modesto. In San Francisco, 6000 people rallied at 24th Street and Mission and marched to Civic Center demanding full rights for immigrants. May Day 2010, a coalition of immigrant rights, Latin American solidarity and labor groups including the Party for Socialism and Liberation and ANSWER coalition, organized the demonstration. As the Banda group Las Krudas played, people gathered with placards reading “alto la separacion de familias,” “ley racist de Arizona ¡Decimos no!” and “Amnistia para todos los inmigrantes.” Following the rally, Yousef and Gaudy, two elementary students, chanted to begin the march. The march went through the heart of the Latino district of San Francisco with a concluding rally at City Hall. At City Hall, speakers reaffirmed the need for unity in the struggle for immigrant rights and the idea that no human being is illegal. As many as twenty thousand immigrants and their supporters streamed through the streets of Seattle for the tenth annual May Day march for immigrants rights. As the march progressed, many joined in from the sidewalks. The march wound through Seattle’s International District and then through the downtown area to Memorial Stadium in the Seattle Center. The marchers were primarily Latino workers and their families. Unions were well represented, with large contingents from SEIU local 6, Teamsters 177 and other unions. Casa Latina and Comite Pro-Amnistia also had a strong presence. About 200 people gathered on the steps of City Hall in Lake Worth, Florida. The Palm Beach Immigrant Rights Coalition, of which the ANSWER Coalition is an active member organized the action in less than a week in response to the signing of SB 1070 in Arizona. Speakers included Jo-Ann Golden, Vice-Mayor of Lake Worth, religious leaders, political activists, students, and members of the Latino community who wanted to express their outrage about the escalation of racist attacks against immigrants. Isabel Vinent, one of the organizers, noted that the line that separates the conditions of immigrants in Arizona and those in Florida is very thin. Only three days after SB 1070 was signed into law in Arizona, Immigration and Customs Enforcement announced that eight counties in Florida, including Palm Beach County, finalized agreements to join the so-called “Secure Communities” program—bringing the total number of Florida counties participating to 24. Similar to the 287(g) agreements that have permitted and granted legal backing for Sherriff Joe Arpaio’s terror campaign against immigrant communities in Arizona, “Secure Communities” places federal immigration enforcement into the hands of local police departments. The program allows state and local police to check the fingerprints of an individual they are booking into a jail against Department of Homeland Security immigration databases. As with SB 1070, this is a prescription for widespread racist profiling against the Latino population. “Our struggle will not end until we win full legalization,” said Juan Jose Gutierrez, leader of the Full Rights for Immigrants Coalition at a massive and historic march on May Day in Los Angeles. The mayor and the media estimated the crowd at 250,000, but the real count was closer to 350,000. Hundreds of thousands of people demanded immigrant rights and legalization in the biggest march in Los Angeles since the mass pro-immigrant marches in spring 2006. The march stretched over 12 huge city blocks and was stationary for hours due to the throngs of people in downtown LA. Along with the main route on Olympic and Broadway, marchers packed the major parallel streets. ANSWER leaders and PSL members Carlos Alvarez and Ian Thompson spoke at the main rally, along with Gutierrez, LA County Federation of Labor Executive Director, Maria Elena Durazo, and other labor and immigrant rights leaders. Other speakers included LA Mayor Antonio Villariagosa, Cardinal Roger Mahoney, Angelina Corona of Hermandad, and Julio Marroquin of LIUNA. Thousands came from throughout the D.C. metropolitan area and the country to rally outside of the White House. Participants included representatives of labor unions, including the Service Employees International Union, student, religious and immigrant rights organizations. A bus of young people came all the way from Florida to participate. During the rally, Illinois Congressperson Luis Gutierrez announced that he and others would engage in an act of civil disobedience, remaining on the White House sidewalk until comprehensive immigration reform was signed or they were arrested. As the crowd militantly changed “Obama, escucha, estamos en la lucha,” 35 people were arrested while sitting-in on the White House sidewalk wearing t-shirts that read “Arrest me, not my friends.” Event organizers have promised continued civil disobedience to demand immigration reform and protest anti-immigrant legislation, such as that just passed in Arizona. Members of the Party for Socialism and Liberation participated in the demonstration and distributed a statement calling for full rights for immigrants and the repeal of SB 1070.